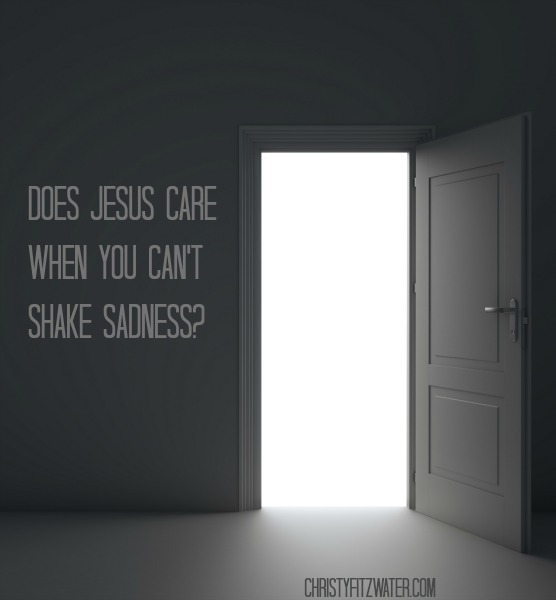 Does Jesus Care When You Can't Shake Sadness? Does Jesus Care When You Can’t Shake Sadness? It’s embarrassing –when you are the pastor’s wife and the mature Christian. Like you should have your emotional act together and tend lovingly to the needs of others. And if you blog on Monday about having a sense of humor, should you blog on Wednesday about being sad? Something triggered my heart to ricochet back to where I was this time last year, in the middle of grief and stress. Couldn’t stop crying, and I felt like I should hide it, because who wants to hear from a sad person when you all have your own problems. So I sighed over your problems intermittently with my own. And Monday was a horrible day at school. I learned I had taught and tested my students on a vocabulary word that was wrong, which isn’t a very big deal at all, unless your fingernails are barely digging into emotional stability as it is. I slumped down against the door Jesus told us to come to. I raised my hand and made a sad little attempt to rap on the wood. Can he even hear this? I knocked again. Sighed. Knocked again. Let’s go for a walk, Matt said. It was a perfect Montana evening –cool enough for a jacket but just warm enough to draw me outside. He took me around the block and straight to Joey and Debby’s house, which has doubled as an ER for a few decades. Being with them is not unlike that heated blanket the nurse covered me with right after I gave birth to Caleb. Bless you, I told the nurse. And bless you, Joey and Debby, for who you are. Bless you for your house walls that beat with the percussion of five boys. But I woke up the next morning again in that heavy place that came uninvited. Tears. Lord, still sad…still can’t make my feet move. So I asked God for a person. I needed a person. A friend. Somebody. Rachel, you can send me a bill if you want. Feeling much revived after that phone call, I managed to work on Spanish lessons plans, which had seemed too much to face just an hour earlier. I typed out Isaiah 53, because it contained some of the medical vocabulary we had been studying in class. I typed about how Jesus was wounded on my behalf. I typed about how Jesus carried my pain so I wouldn’t have to. Then, no kidding. NO KIDDING. I opened Facebook and saw this article: Did Jesus battle depression? And the writer talked about Isaiah 53 and how Jesus knows our sorrows. Now here I am racing to tell you that Jesus experienced the weight of sadness. Our sadness. He knew what it felt like. He can make our hearts beat strong instead of dragging across the floor. And I’m telling you that you can pray about how you feel –make that faint rap on the door –and Jesus will swing it wide open for you. I really appreciate what you wrote especially the part on asking for someone to talk to asking for a person!! That just helped me out a lot. I normally think of it in my head but never think to verablize it! Yeah, sometimes we need a face and a voice and a hug. God can provide those things just like he can provide financial help or strength for a task. Christy, your post really struck a chord with me yesterday and I have just now read the article asking if Jesus also struggled with depression and I wept-which isn’t always easy for a person on antidepressants…THANK YOU seems so inadequate…for sharing your struggle, and this article, and for the renewed hope to keep knocking. I’ve only struggled with short-term depression, and it’s awful. It’s hard for the people we love, too. My heart goes out to you if it’s been a long battle. I pray God will keep encouraging you and that you’ll keep having the faith to ask him for what you need. Thank you, Christy, for your words. Came at just the right day. Our paths rarely cross but I sure appreciate you! I’m glad if you were encouraged, Alisha. Thanks for the note. Thank you Christy- you always encourage with your honesty and insight.